More memories. 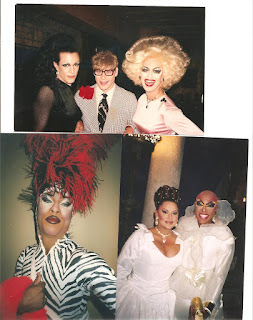 Reading the gallies of South Beach Star is like reliving a part of my life as is going through my photo files. I've been going through the photo files looking for photos of Larry Callendar who was the owner of 821, a landmark on South Beach's nightlife scene. Larry passed away this past week and he'll be missed as he was one of South Beach's pioneers. While going through the photo files I've been pulling photos of some of the people mentioned in South Beach Star. Here are a couple of photos of some of those that populated the nightlife scene during the time of South Beach Star. What ever happend to Paloma Delaurenti?Is it true she was busted cooking 10 pallets of meth in forte towers ?